Bill Mayher, away from his home on the Maine Coast of America for a two year teaching stint at the American School in London, was ambling down Cork Street in 2007, when he was stopped in his tracks by the sight of a painting in the window of a gallery. 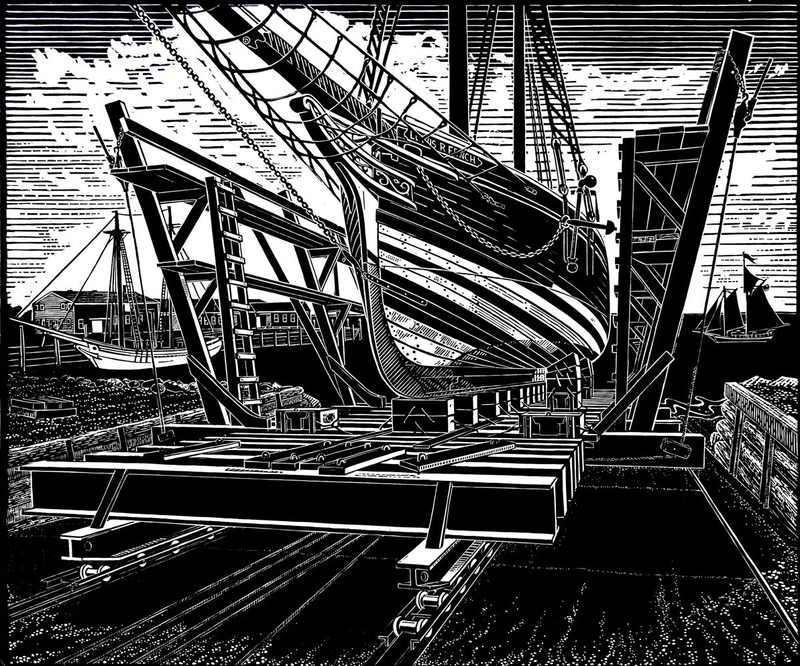 The painting was of a wooden boat under construction. As someone who was not only a teacher, but also an expert and a writer on boatbuilding, he knew at once that the painter must also have been a boatbuilder. On seeing the rest of the exhibition, Bill was struck by the authenticiy and power of all of the work, paintings and prints. He was naturally very keen to meet the artist and a weekend visit to Wivenhoe was arranged for himself and his wife Caroline. To his delight, they were treated to a tour of Wivenhoe and surrounding towns, each with its own slice of maritime history and “a fascinating tour of East Anglian vessels”. 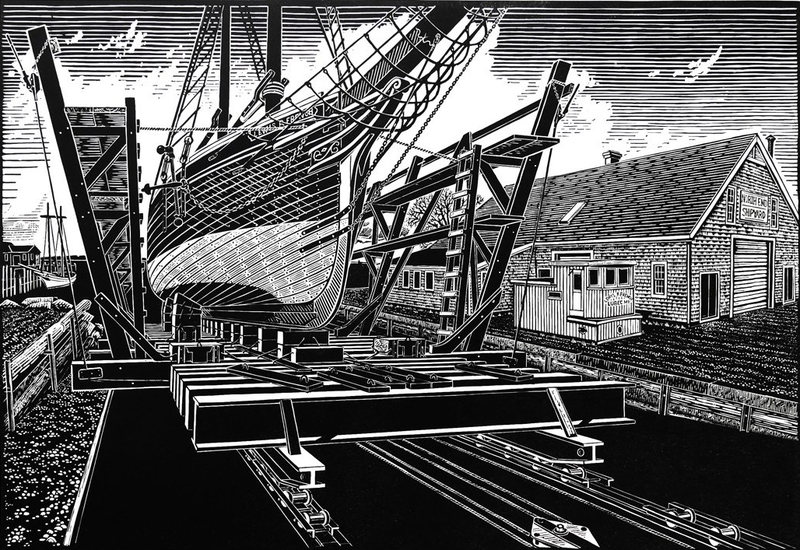 He was particularly impressed by the history and renovation of the Pioneer: “heroic in her working life… in her recovery and restoration” and in the many linocuts and paintings done of her in the process of restoration by Jamie: “which materially helped to publicise and fund the project” and without which “the maritime history of the Colne and Blackwater estuaries would have slipped into the mud along with its hulks.” His enthusiasm for Jamie’s work and its subject matter was translated into a comprehensive article for Wooden Boat Magazine, which was reproduced in the catalogue for Jamie’s 2009 show at Messum’s in Cork Street. Bill and his wife then invited the entire Dodds family for a holiday in Maine, where they were treated to a reciprocal tour of the islands and to the benefit of Bill’s fund of local knowledge, not only on boatbuilding, but also on Maine culture, history, geology and ornithology. Being immersed in Maine maritime culture brought Roger Deakins’ marvellous book Waterlog to Jamie’s mind, so he gave Bill a copy on their return to the UK “because it reminded me of the kind of tour Bill gave us in Maine”. Jamie jokingly said of Bill that he had a story for nearly every tree! During the visit, Maine residents asked him whether he knew of the work of their local printmaker, Carroll Thayer Berry, who had lived and worked in Rockport from 1945 to 1978. Like most British people, Jamie had never heard of him. When visiting Rockport and seeing some originals, Jamie was astounded by the similarities of their work. 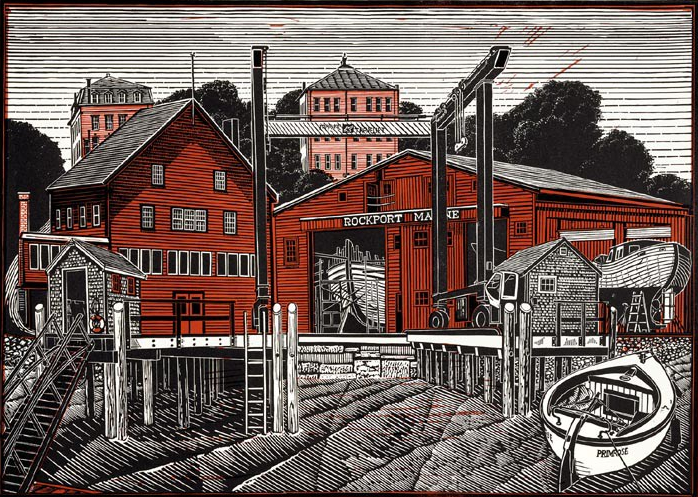 Not only did they share the same the subject matter of boats, boatyards and the local coast, but Berry also worked primarily in the same medium of linocut. From the visit Jamie was inspired to produce five new prints, three of which are magnificent two-colour linocuts in the best Dodds tradition, in which his mastery of the technique comes to the forefront. 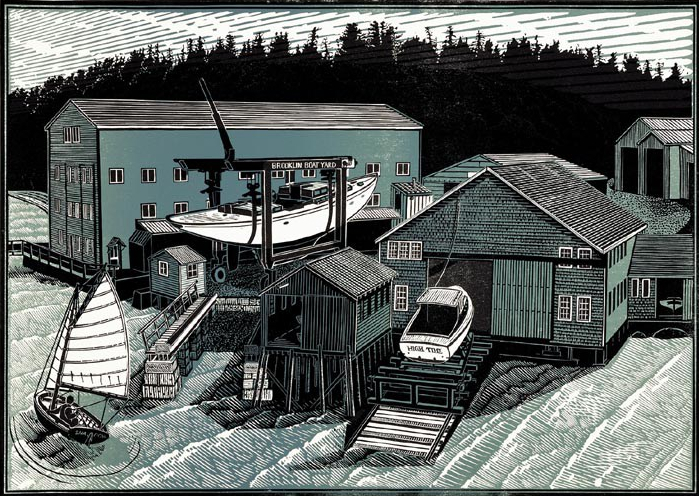 Rockport Marine, Brooklin Boat Yard Past and Present and Benjamin River Boat Yard were a direct response to what he saw in the Maine boatyards and give a gentle nod of acknowledgement to the two-colour prints of Carroll Thayer Berry. Brooklin Boat Yard Past and Present depicts the view of the boat yard from Cradle Cove where Jamie and his family stayed in their own wooden cabin right down by the water. 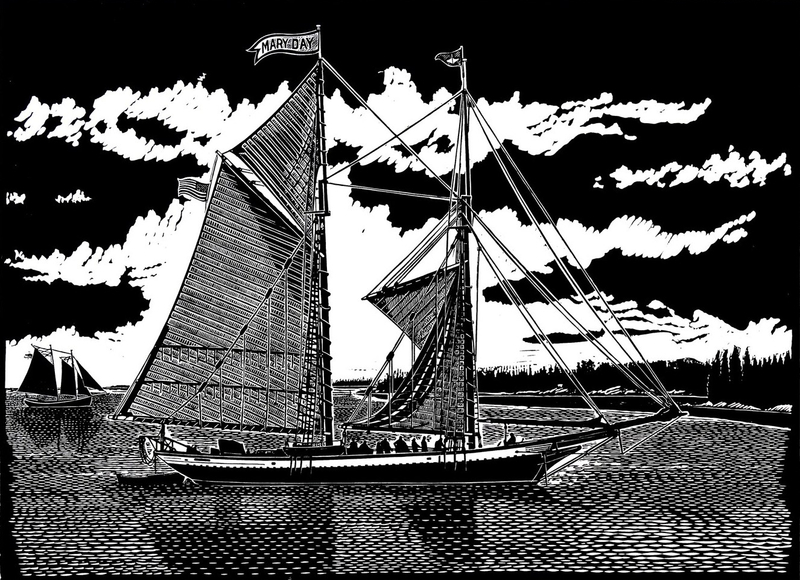 It shows a 90 foot wooden yawl being built that was later launched using the new method with a travel lift, as well as the old launching method on slipways, appropriately called railways in America, with a wedge-shaped carriage called a cradle that goes up and down on rails. All the boats have their own wooden cradles, which are moored up out of the way during the summer months ~ hence the name Cradle Cove. 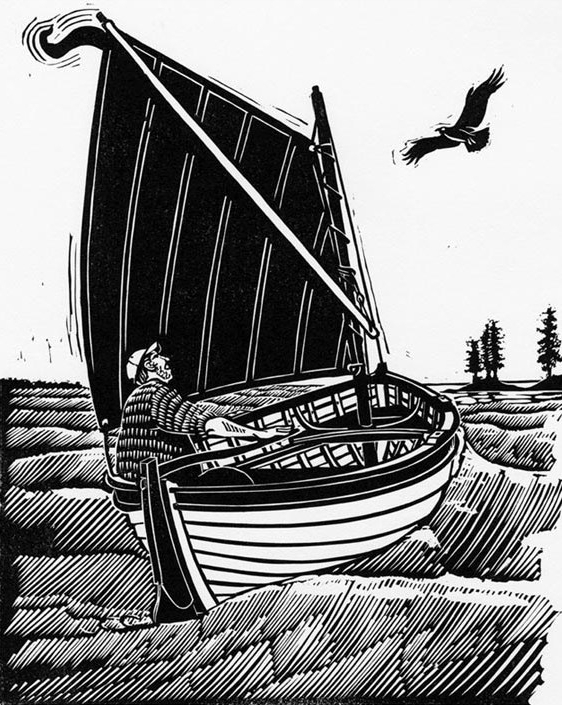 The other two prints are of a Maine Lobster Boat at Bridges Point Boat Yard, a straightforward and elegant monochrome linocut, and Around the Islands in search of a Good Story, also in one-colour; a romantic image of Bill Mayher sailing a locally built Peapod. The Peapod is constructed by an entirely different method than our own small boats, i.e. upside-down. The 2009 Messum’s show included several paintings of Peapods and canoes in the process of being constructed in this intriguing way.